Available from me directly as well as now posted on Etsy, this black & white painting was originally done specifically for a local Sorenson Gallery, Black & White show. All entries were in B & W, including sculpture, ceramics, watercolors, and drawings. It was a great show and a lot of fun. As a Civil War reenactor, I thought a painting of a battle scene in a black & white would look like a large period photograph. It could have been done in a different style, looser perhaps, with splatters and scratches, as if it was a damaged tintype. But, in the end, I didn’t get too crazy with this first one. For that show, there was no red in the 2nd National flag. After the recent Confederate flag uproar, my wife suggested I add the red to the flag. 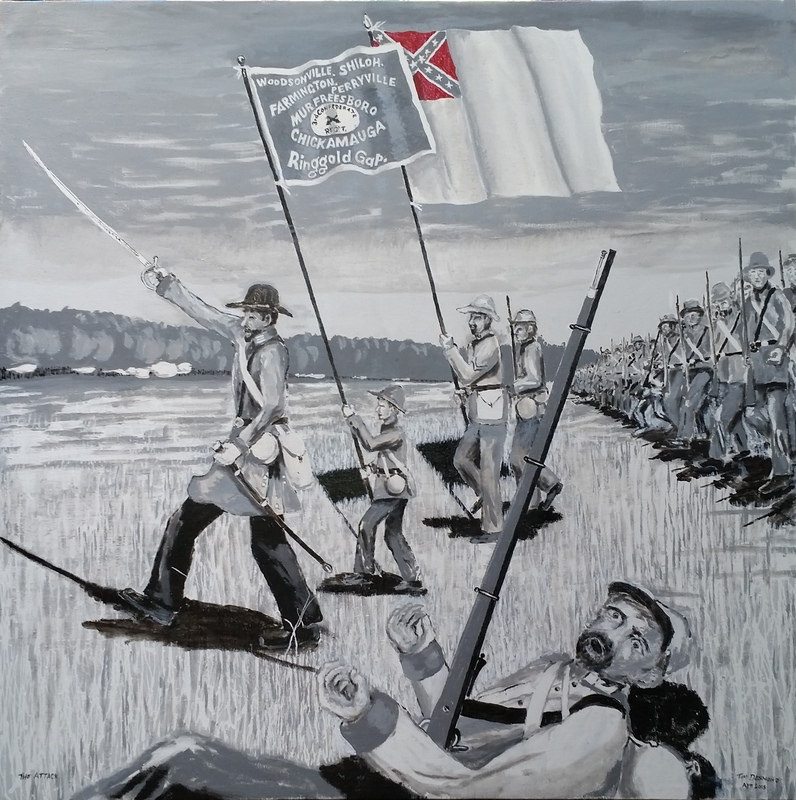 Having been a member of a reenacting company in the 3rd Confederate Infantry Regiment, a trans-Mississippi regiment in the Army of Tennessee, we portrayed the era of the Atlanta Campaign of summer of 1864. The two flags here show that. The smaller blue flag with center moon and the battle honors painted in white, was a flag in Cleburne’s Division. This is a battle flag pattern that General Hardee designed, and when the entire CSA was changed to the uniform Beauregard pattern of “Southern Cross” in 1864, General Patrick Cleburne refused to adopt. He said his men fought and died for the blue flag for three years. The other flag is the 2nd national CSA flag also called the “Stainless Banner.” It has the Southern Cross pattern in the corner. This attack depicted could have been in the second phase of Battle of Atlanta, of a company in Govan’s Brigade, Cleburne’s Division, Hardee’s Corps.